Let people with disabilities or in wheelchairs know where the accessible entrances to your store, business, or building are located. 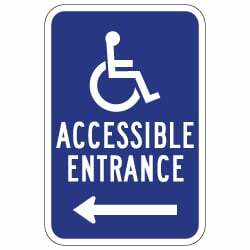 Use this Accessible Entrance sign with left arrow for guiding visitors to handicapped accessible entrances on your property. ADA regulations do not require Braille for guide signs. This durable aluminum sign is rated for seven-plus years of no-fading outdoor service. It is also a reflective sign, making it useful day or night and especially in low-light parking areas and walkways. When a business or property owner displays ADA guide signs they are improving safety and ease of use for all their customers and visitors. DOUBLE the working life of your ADA Wheelchair Accessible Entrance Signs by adding 3M Protective Overlay Film (POF)! 3M’s high-tech POF protects sign faces against fading caused by the sun and harsh weather—and makes graffiti and sticker defacement damage easy to clear away without harsh abrasives.